Well I'm going to shoot right off the cuff here and try and get some content on this blog. I've been working on a nightstand for a couple of months now. It's a match to the bed I made for my wife and I. 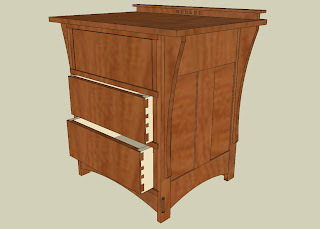 Here's a photo of the completed bed and the Sketchup model for the nightstand. I purchased the plans for the bed from Wood magazine and modified the stock plan somewhat to make the bed into a King sized. It turned out great and I great a great sense of pride every time I see it. 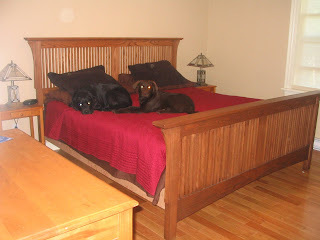 The only thing that bugs me a bit is that though it's a Craftsman style bed, I used plainsawn red oak as a material. The reason for this is economics. I'd love to have used the traditional quarter sawn white oak but in this part of the world, (Atlantic Canada) White Oak is pretty hard to come by. I spoke to one sawmill who specializes in custom hardwood orders who told me that in the 7 years he's been in business, he's only ever seen 6 white oak logs. The other option I guess would have been to order some online but I haven't had the courage yet to spend my hard earned cash on wood sight unseen. That being said, shipping the necessary boards from the southern US would have been prohibitively expensive. Now If you look at the picture of the bed you can see that we're using some pretty dinky little nightstands my wife bought at the grocery store for $10 a piece. So among the seemingly unending list of furniture projects I have, the nightstands jumped out as a priority. The matching nightstand plan from wood magazine was nice but I wasn't keen on the single drawer and open bottom. So I decided to use Google sketchup to modify the stock plan to include three drawers, modify the "backsplash", use all solid wood and add some exposed joinery for the project. I'm trying to make sure that every one of my projects increases in difficulty level and though the bed is physically bigger it was much simpler to make than the nightstand. So to match the bed, I'm using plainsawn red oak and intend to finish the project using Varathane's mission oak stain and topped with Minwax Wipe-on satin Polyurethane. The drawer insides will be finished using shellac to make sure that my clothes don't smell of poly. So I'm going to jump ahead here and show you the pics of where I'm at with the nightstand project right now. So as you can see I've got the side and back frames made with the panels pre-stained. The front stretcher is installed and three of the four drawer support frames have been fit and glued in. The corbels are just clamped on temporarily for the photo. I'm waiting for the top to be installed beforwe adding the corbels. that way I can ensure a nice tight fit. The drawer support frames are made using half lap joints and are dadoed into the side frames. The front part of the drawer support frames overlap the sides by 1/2" inch just to give some visul depth. As you can see from the next photo, I used a wedged through tenon for the front stretcher. I had some spare jatoba lying around and used that for the wedges. It's the first time I ever tried this joint and am pretty pleased by how it turned out.